Not only was there sewing to do for the wedding itself, there was sewing for bridesmaids gifts as well. 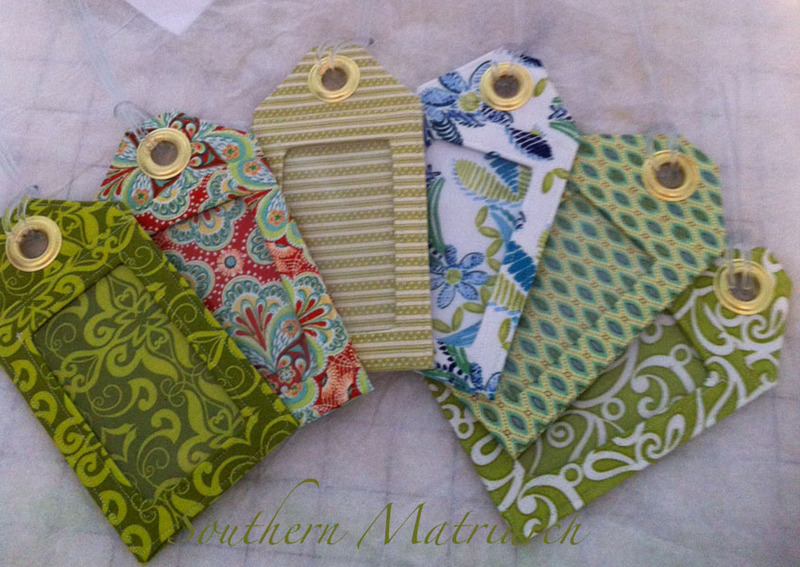 Back in the spring a fellow SAGA chapter member presented a program on making these cute luggage tags. I thought they would be fun to do as bridesmaids gifts. 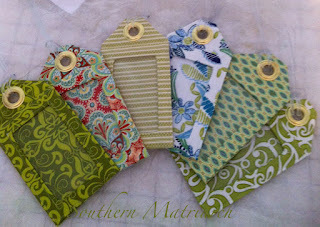 I chose a variety of fabrics featuring the color green, gathered my supplies and got to work. I also made a set for the bride to have as well. For the "hangers" I used the hangers from some self laminating tag kits from Office Depot. 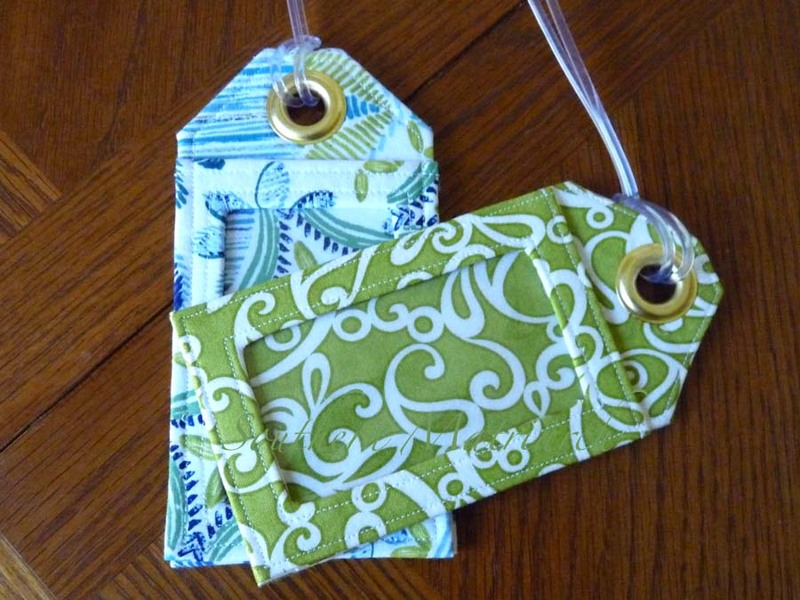 I can't find a tutorial online that exactly matches these tags but I did find a pattern on Etsy for purchase that matches. I just used larger grommets. 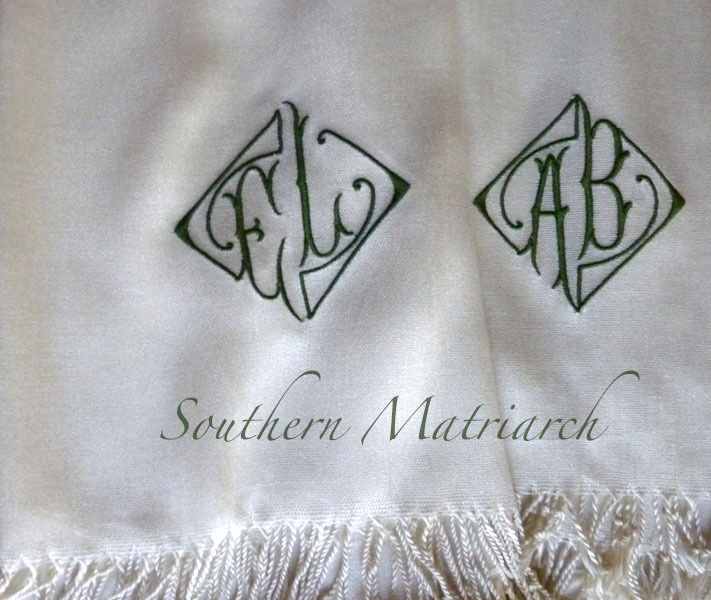 The bride purchased "pashminas" for the girls and asked that I monogram them. I use the term pashmina loosely because in no way are these exotic cashmere wraps like the more luxurious pashminas to be found that hails from Nepal or Northern India. Think acrylic fibre from Taiwan. That being said, they are very soft and were just the right color. These came from a place called ABC Trading. A costume jewelry lover's paradise here in town. I used a two letter monogram from The Itch 2 Stitch using a deep green for the thread. "Magnolia green" said in my best Julia Roberts voice. They were a big hit. I am trying to bring some order to this house before I leave for convention on Tuesday. I leave you with this for a chuckle. Amazing... how did you get all your little projects finished! Fun to see what you have been up to while hiding away! Glad that you will be at SAGA. See you there. Are you taking early classes? 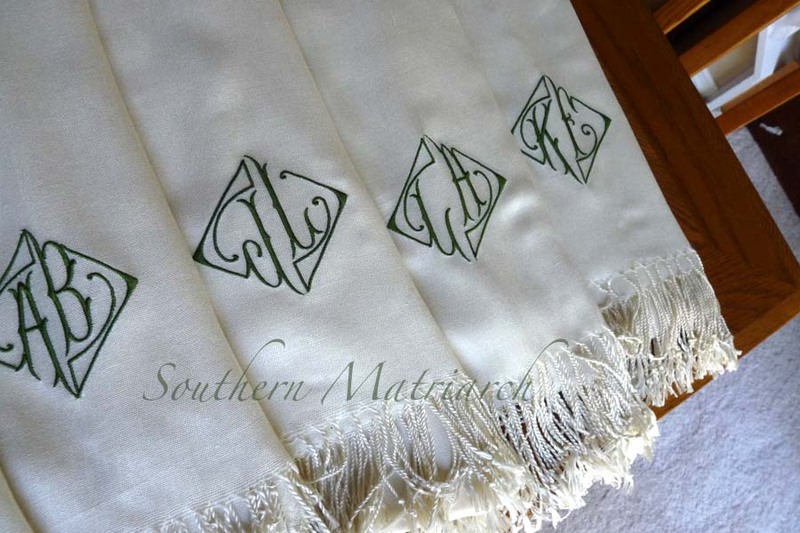 I love those monograms on the scarves, what a lovely gift. Have a good time at convention, I'm not going this year. 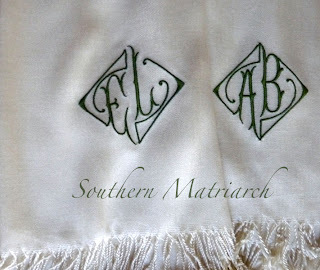 Where are on the pashmina did you put the monogram? Gorgeous, by the way! Thank you for sharing valuable information. Nice post. I enjoyed reading this post. The whole blog is very nice found some good stuff and good information here Thanks..Also visit my page Bridesmaid GiftsElla Vickers produces high end, designer tote bags for all sorts of uses. The tote bags are made from recycled sailcloth.